The much-rumored Huawei MediaPad 10 FHD got a soft launch at about the same time the company was announcing its Ascend D series of smartphones. Huawei plans to officially unveil the tablet on Monday, the first official day of Mobile World Congress here in Barcelona, but managed to get some hands-on time and details ahead of schedule. This 10.1-inch tablet takes design cues from its 7-inch MediaPad cousin, also known in the U.S. market as the T-Mobile Springboard. The back is a mix of brushed aluminum, with off-white plastic accents running along the upper-horizontal regions. Also on the back are two speakers, one on the left and right side of the device. The MediaPad weighs 1.29 pounds, making it a bit heavier than the Apple iPad 2 and the original Samsung Galaxy Tab 10.1. At just 0.35 inches thick, the MediaPad is among the thinnest tablets available thus far. In handling the tablet, I found it comfortable to hold, even one-handed. The tablet will have a quad-core processor, although it was unclear whether that processor will be the same K3V2 CPU that is found in the D Series phones, or if Huawei is using another chip supplier. Of note: A Huawei representative showing off the MediaPad said it had 2GB of RAM, which would set the tablet ahead of the competition by a full gig. The MediaPad has a 1920 by 1200 pixels display, which makes it the latest tablet to join the unfolding full HD masses--Acer and Asus both introduced high-definition tablets at CES. Huawei says the display density is 226 pixels per inch (ppi), which is considerably higher than the 150ppi that a typical tablet has. The images shown on this higher density screen appeared bright and colorful. 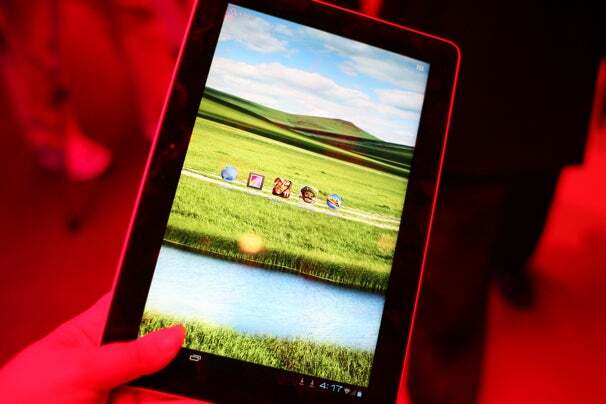 The tablet will come in 8GB, 16GB, and 32GB capacities, with a microSD card slot for adding more storage as needed. The MediaPad will support LTE, and has a 5-megapixel rear-facing camera as well as a 1.3-megapixel front-facing camera.. Multimedia should rock, too; Huawei said that the tablet is equipped with Dolby Mobile 3.0 Plus 5.1-channel surround sound. Huawei will ship the MediaPad 10 with Android 4.0 Ice Cream Sandwich (ICS). The ICS build I saw on the unit I handled appeared suitably responsive to touch, but otherwise didn't look any different from standard Android—with the one exception of a customization to the unlock screen that lets you quick-launch directly into an app of your choosing. The MediaPad 10 FHD is destined for worldwide markets, but at the time of this writing we don't know anything about pricing and availability. We'll bring you more details and update this piece when Huawei makes its official announcement on Monday in Barcelona.